The third sinking fund definitive used the Pasteur design for the 1.50-franc value with 50c surtax. It was later replaced with the Sower design. The second Sinking Fund special stamp shows “The Smile of Reims,” a smiling angel on a facade of Reims cathedral. The Sinking Fund special stamps proved more popular than the definitives. The second Sinking Fund definitive used the Sower design with background lines for the 50c value with 25c surtax. Although the stamps were aimed at collectors, the definitives were not very popular. The first Sinking Fund special stamp was also the first line-engraved stamp issued by France. It pictures a male industrial worker and woman farmer. A steep 8.50f surtax was added to the 1.50f postage value. Starting in 1927, France issued semipostal stamps with the surtax going into a sinking fund to pay down World War I debt. This first of three definitives used the existing Sower design without background lines for the 40-centime value with 10c surtax. In the Scott Standard Postage Stamp Catalogue listing for France semipostal stamps, the heading “Sinking Fund Issues” appears after number B23. These three words introduce 18 stamps with an unusual story. A sinking fund is an amount of money raised with periodic contributions and set aside to pay for a future expense or repay a debt. After the brutal First World War, it was debt that concerned France. France had borrowed heavily to finance the war effort and reconstruction. The expected reparations from Germany did not materialize. By the mid-1920s, the French franc had fallen significantly in value and inflation was rampant. 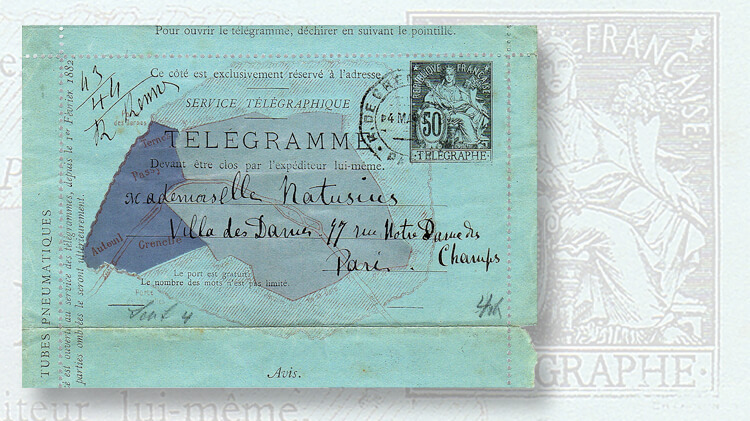 One indication of this was the basic internal postage rate for letters, which had quintupled from 10 centimes at the start of 1917 to 50c starting in August 1926. In mid-1926, Raymond Poincare became prime minister and set out to stabilize the franc. Part of the effort was the creation of a sinking fund to retire the national debt. To provide part of the money for the fund, the French government decided to issue semipostal stamps for five years. The cost of the stamps above the postage rate would be added to the fund. The law authorizing the stamps specified that three definitive stamps and one special stamp (like a commemorative) would be issued each year. While the government hoped that many people would buy the stamps, they especially hoped that stamp collectors would like them and thereby contribute to the fund. Pneumatic tubes and how mail was moved in Paris for more than a century: The tube system allowed the mail to be moved faster than would be possible on the crowded city streets. The definitive stamps used the existing Sower and Pasteur designs with a simulated overprint of “Caisse d’Amortissement” (on the Sower) or “C A” (on Pasteur), and a simulated surcharge of the additional value. The overprints are simulated because, unlike true overprints that are added to existing stamps, these overprints were printed together with the stamp image. The first Sinking Fund stamps were the three mandated definitive stamps (Scott B24-B26) issued Sept. 26, 1927. The 40c stamp with the cameo Sower design paid the postcard rate and had an extra 10c added for the fund. The 50c Sower stamp with background lines paid the internal letter rate and had an extra 25c added. The 1.50-franc stamp with the Pasteur design paid the foreign letter rate and had an extra 50c added. The Sinking Fund definitive stamps were printed in colors that were never used for regular issues. For example, the normal version of the 40c Sower without background lines (known as the cameo Sower) appeared in olive-brown, vermilion, violet, and ultramarine. The Sinking Fund versions, with the 10c surcharge, appeared in blue, gray-violet, green, rose, and olive. This was done to discourage counterfeiting, but today many forgeries exist, probably created well after the stamps were issued and aimed at collectors. The first special stamp (Scott B27) followed on May 15, 1928. It shows the heads of a male industrial worker and woman farmer, symbolizing industry and agriculture. The words “Caisse d’Amortissement” appear at the top. The postage value of 1.50f is at lower left, and the added value of a whopping 8.50f is at lower right. Probably to make it attractive to collectors, it was printed by line-engraving (also known as recess printing), the first French stamp to be printed by this process. To create a sense of urgency, the stamp was on sale only until the end of May. Collector response to the Sinking Fund stamps was disappointing. Reports of the number of the initial Sinking Fund stamps printed and sold differ, but they consistently indicate that for the first issues only about 10 percent of the stamps were sold. The remainder was subsequently destroyed. In spite of this reaction, the law was followed, and on Oct. 1 of the next four years, the three definitive stamps were reissued in new colors with the same values and the same designs, except the 1.50f + 50c was converted to the cameo Sower starting in 1930. Numbers printed and sold apparently decreased drastically over that time. 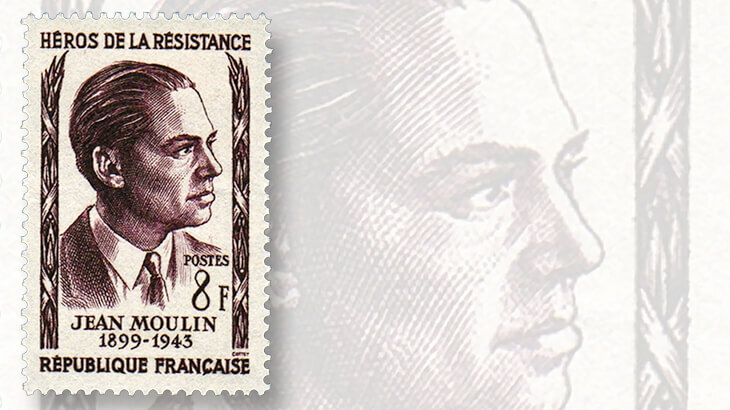 When France honored 27 heroes of the World War II Resistance on stamps: France issued stamps honoring more than two dozen heroes of the resistance, all but one of whom were killed during the war. The Scott catalog values for the sets of three stamps increase for each succeeding year, reaching $240 for an unused, hinged set of the three 1931 stamps (Scott B39-B41). Only two additional special stamps were issued. The second (Scott B34), issued March 15, 1930, shows “The Smile of Reims,” also known as “The Smiling Angel.” It is the smiling face of a statue of an angel on a facade of the Cathedral of Reims. This is the only known example of a smiling angel on a Gothic building and is therefore popular. The surtax was reduced to 3.50f in addition to the 1.50f postage, probably to make it more acceptable to collectors. Almost half of the 580,000 stamps printed were sold. The final special stamp (Scott B38) appeared March 1, 1931. It was line-engraved, like its two predecessors, and shows four women in traditional headdresses of the French Provinces. It was also denominated 3.50f+1.50f. After the relative success of the previous special stamp, 2 million of the final special stamp were printed, and 600,000 were sold. The last of the Sinking Fund stamps were taken off sale in 1932, and all were demonetized in 1936. The fund itself continued until 1958. In addition to having faux overprints and including the first line-engraved stamp, the Sinking Fund issues are notable for representing the economic turmoil of post-World War I Europe. Besides repaying their debt, France and many other countries tried to control the severe inflation of the 1920s by returning to the gold standard that they had dropped during the war. This linked the amount of available currency to the country’s gold reserves. Controlling the amount of currency limited demand and therefore the rise in prices. From 1926 to 1932, France’s share of the world’s gold reserves jumped from 7 percent to 27 percent, quite an increase for a relatively small country. More gold for France (and the United States, which was also hoarding it) meant less for everyone else. Prices started falling, and with it, economic activity. This at least exacerbated the Great Depression, leading countries to drop the gold standard for good. The United Kingdom was first, in 1931, and other countries followed, including the United States in 1933. France in 1936 was among the last. The Great Depression eased, though robust economic activity did not return until the beginning of World War II.